Exhausted. Emotionally drained. Physically spent. Left it all on the court. All of those applied to the boys of the James Logan basketball team at the Golden 1 Center on March 8. 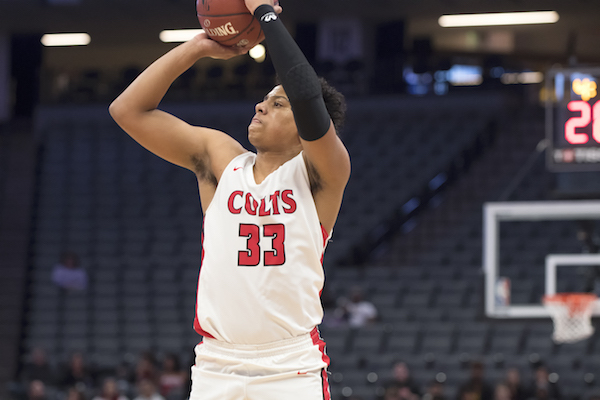 The Union City school’s epic postseason run came to an end in a hard-fought 69-63 loss to Chino Hills in the CIF Division I boys state final. 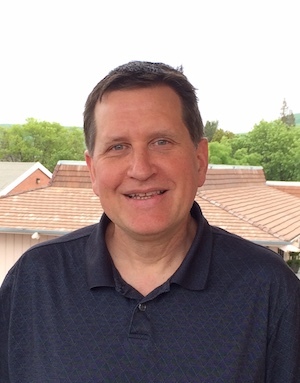 A championship game which saw them mount what earlier seemed an improbable comeback. But they came darn close to making it a reality. 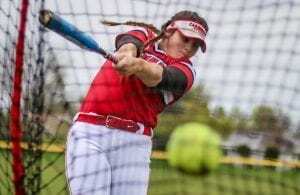 This fight came against the Huskies, who were in the state finals for the fourth time in five years. They came away with championship No. 3 and their second straight in Division I, but not before a furious finish by the Colts, who trailed 50-31 midway through the third quarter but drew to within 63-61 with 52 seconds to play. It was a rock ’em, sock ’em second half that saw five starters foul out, three from James Logan and two from Chino Hills — most notably center Onyeka Okongwu, a 6-foot-10 mighty force who will next play for USC. Every bit of adrenaline and emotion seemingly was exhausted after the game was over. 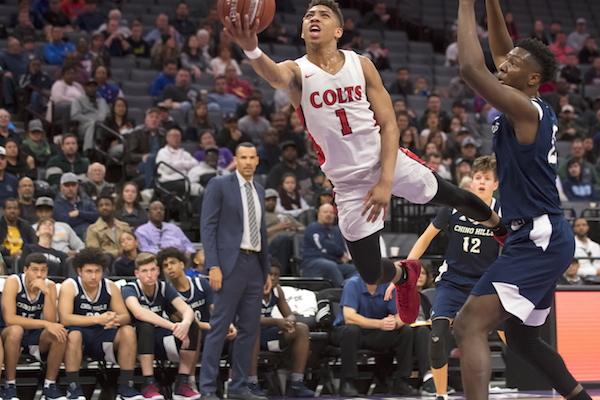 It was the end of a wild playoff ride, which included a thrilling 86-83 win over Dublin in the North Coast Section Division I semifinals on a Tim Oldham 3-pointer, a loss to De La Salle-Concord in the NCS finals and then a NorCal sweep past Folsom, Bishop O’Dowd-Oakland and Branson-Ross to reach the state finals for the second time in three years. 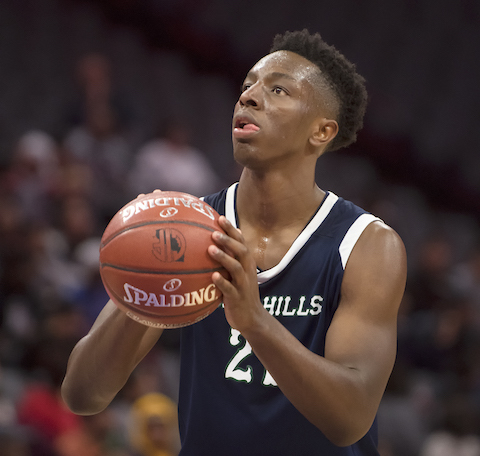 Chino Hills’ USC-bound center, Onyeke Okongwu, had 26 points, 15 rebounds, five assists and three blocked shots when he fouled out late in the third quarter. 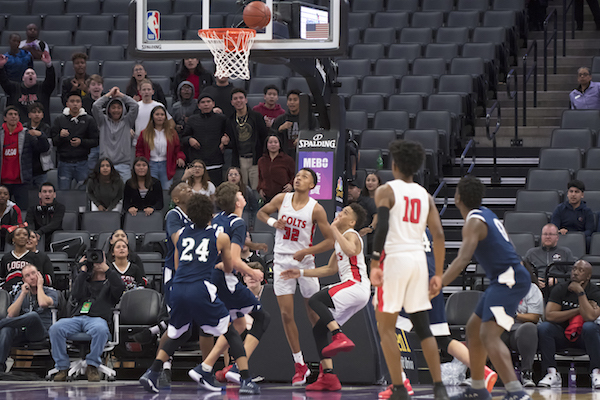 Okongwu has been the star this season for Chino Hills, the school best known for the Ball brothers — Lonzo, LiAngelo and LaMelo — who along with Okongwu were part of the Huskies team that beat De La Salle 70-50 in the 2016 Open Division state championship game to finish that season undefeated. The Ball brothers have each moved on, and this year’s team certainly was Okongwu’s. 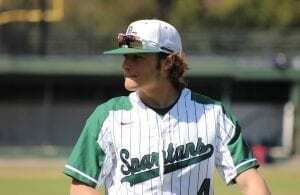 RELATED: Click the logo to see where James Logan finished in SportStars’ Final NorCal Top 20 Rankings. Early on, Okongwu was held in check. The Colts held him scoreless until the 3:40 mark of the first quarter. But he broke out in the second for 13 points, and the Huskies led 41-28 at halftime. But after the break, Okongwu ran into foul trouble. When he shockingly fouled out with 1:30 left in the third quarter, the crowd reaction shook the arena. He left with 26 points, 15 rebounds, five assists and three blocked shots — and with his team up 15 points. Senior guard Brett Thompson had 13 points when he fouled out mid-way through the fourth quarter. Despite power forward Daniel Combs and then star guard Brett Thompson fouling out, there was still life in the Colts. A Hawkins basket cut it to 59-51, the first single-digit deficit since the second quarter. Oldham hit a couple of huge baskets, and Logan trailed just 62-58 with 1:36 left. Chino Hills’ Nick Manor Hall also had fouled out, as had Logan’s Malcolm Steadman. When Hawkins converted a three-point play to culminate a 17-4 Logan run, suddenly that mighty Chino Hills lead was down to 63-61 with 1:30 to go. After a Uduakobong Essien putback brought the margin back to five, a pivotal call came when Hawkins launched a 3-pointer but was called for an offensive foul. Senior post Gabriel Hawkins hit some big fourth-quarter shots to lead the comeback and finished with 16 points and 10 rebounds. 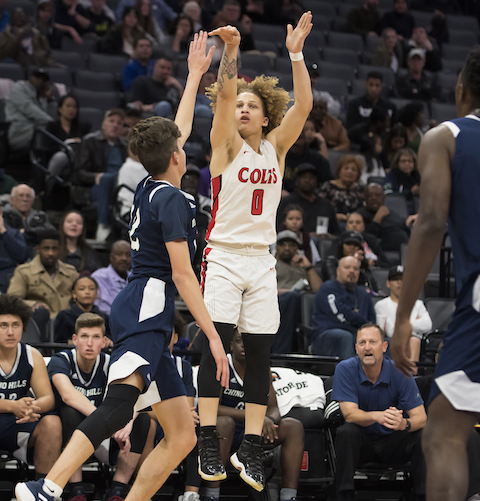 Though Hawkins knocked down another basket with 23 seconds left, the Huskies finally locked up their third state title in four years after Will Pluma’s two free throws with 9.7 seconds left. For Logan, Brahjon Thompson finished with 19 points and three steals. Hawkins had 16 points and 10 rebounds, and Steadman had eight points and eight rebounds.